Hello, great post - I´m just struggling with an agency in New York - [Redacted] - hands off!! Two invoices overdue for 66 and 16 days trying to cut 50% of last invoice arguing the end client is requiring this due to repetitions. None of this was in the contract, the low rate was general, for all text of a mega project (including legal and IT parts). The text is online for over a month now, we are a team of around 10 translators struggling for our money. Absolutely incredible. This agency is an outsourcer [Redacted] called agency and has no seriousness at all, being herself a translator and teacher for translation... !!! I have not published this comment, and quoted here with the relevant names redacted. On the one hand, I have no reason to believe the angry translator who left the post is not telling the truth about her particular experience. On the other hand, I've checked this agency both on Payment Practices and on the Blue Board - and in both places the agency in question enjoys an excellent reputation. If the translator who left the original comment reads this post, I encourage her to leave her comments in the appropriate fora, such on the Blue Board, on Payment Practices or on the other agency rating lists - some of them do investigate non-payment claims, and might be able to help. This is also a good occasion to set some rules on comments about other translation companies: this blog is not the venue for it - please go and add your comments on Payment Practices, the Blue board, TCR or any of the other payment practices lists. Since I have no means of investigating claims of non-payment, leaving such comments published here could damage the reputations of perfectly legitimate companies. 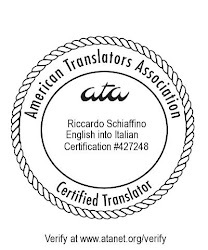 If the claim is true, this still is not the place for it: most other translators, when researching the reputation of translation companies, do not look here. Those are easy - I just delete them. What an outrageous attitude on the part of the agency! And how to choose a decent company that won't aim to let you down upon submission of the translation project?